The Giants and Patriots played an excellent game last night. The Super Bowl is the biggest football game of the year, but there have been many disappointing games. This one was a thriller that came down to the very last play. The halftime show was typical—overblown and uninteresting. Sports Illustrated lists their top ten Super Bowl halftime shows. They list U2’s performance in 2002 as number one, and it’s easy to see why. That was the first Super Bowl since the terrible events of Sept. 11, 2001 and the country was still getting to grips with what had happened. It’s only 12 minutes, but it was absolutely powerful. 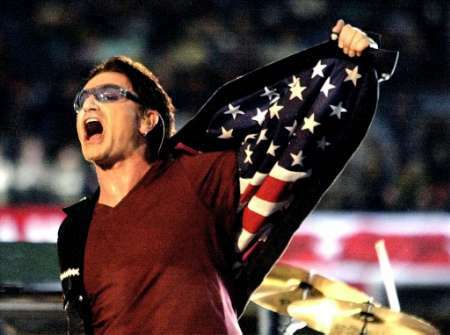 Bono had a special jacket made up with football stitching and an American flag for the inside lining. What I love is that the performance unmistakably gathered the emotions of the country, but did so in a way that didn’t endorse any particular political viewpoint or foreign policy agenda. It’s hard to believe it was ten years ago. Check it out. Seriously, I’ll never forget that moment 10 years ago. We were with a load of American post-grads in Scotland and it got real quiet . . . there weren’t too many dry eyes, frankly. Powerful stuff. It seems that they’re at their best when they hit certain transition moments. At that point they were coming off their 90’s experimental phase and returning to straight-up rock. I love the concert video of their return to Slane Castle–hits all the right notes.